Rhubarb season is finally here. I know some parts of the country have already seen rhubarb popping up at groceries and markets (those lucky bastards) but we only started seeing them a couple of weeks ago. I couldn’t resist, so I bought a couple of pounds with the intention of doing a few different recipes. I saw this recipe pop up on Closet Cooking, and since I had 4 pounds of strawberries to use up, it seemed like the perfect way to start. But, as a complete rhubarb novice who hasn’t really ever eaten rhubarb before, I didn’t realize that you were supposed to peel it first! But even with that, this cooks long enough that the skin doesn’t seem to matter. At least, neither my rhubarb-loving husband nor I noticed. I thought this came out beautifully. I used a combination of whole-grain flours and added cardamom, which boosted the flavor considerably. I love crumbles for their simplicity – toss fruit with sugar, top with a mixture of flour, oats and more sugar. However, to cut down on at least some of the sugar, I used one of the stevia-sugar products, Sun Crystals, to acquire the same sweetness without as many calories. Now if only there was such a thing for brown sugar! One thing I hate about fruit-based recipes, however, is the insistence of American recipes for volumetric measurements. I have a hard time figuring out how many strawberries will fit in a cup! So, I cut my fruit into pieces and measured out one cup’s worth of each, weighed it and wrote it down. Frankly, crumbles are forgiving – if you want to use 1 pound of strawberries, I’m sure you’ll be forgiven. Combine 6 packets of sweetener, cornstarch, 1/2 tsp cinnamon and 1/4 tsp ground cardamom in a medium bowl. Add strawberries and rhubarb, then toss to coat. Pour the fruit into an 8″ square oven-safe casserole dish. In a small bowl, stir together the flours, oats, brown sugar, butter, remaining cinnamon and cardamom. Sprinkle over the fruit evenly. Bake at 350F for 45 minutes until the top is golden brown and the fruit is bubbly. Truvia is another good sweetener. Or, if you prefer, use 1/4 cup of regular sugar. If you’d rather not use three different types of flour, you can use all of one or even just all-purpose. Only taste really matters in this application. This entry was posted in american, dairy-free, pie, recipes, side, snack, untranslated, vegetarian. Bookmark the permalink. Cori, The crumble recipe is really close to how I make it. I have lots of rhubarb ready to cook in my backyard! Catherine: What do you do differently? Boy, you’re lucky to have rhubarb in your garden! I’m definitely jealous – it’s quite dear locally. 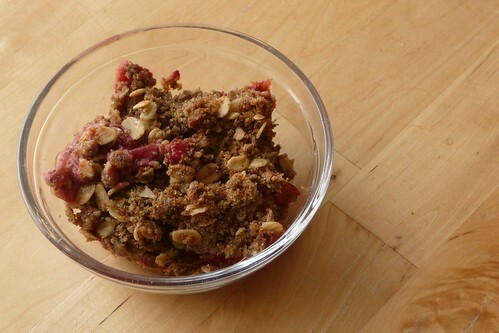 Left-over strawberry-rhubarb crumble is delicious with vanilla yogurt.